The Global Volcanism Program has no activity reports for San Francisco Volcanic Field. The Global Volcanism Program has no Weekly Reports available for San Francisco Volcanic Field. The Global Volcanism Program has no Bulletin Reports available for San Francisco Volcanic Field. 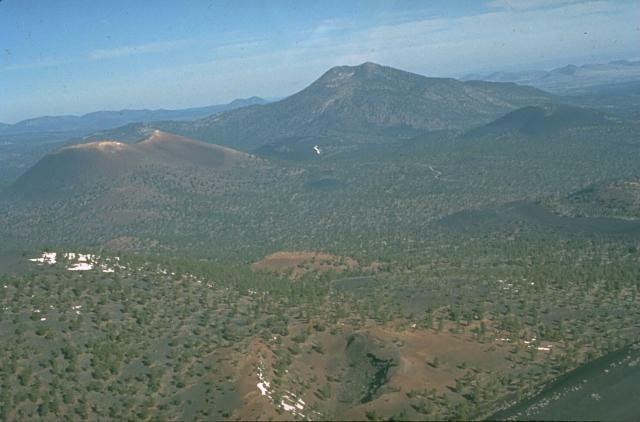 The vast San Francisco Volcanic Field in northern Arizona has more than 550 vents, the youngest of which is Sunset Crater, named for its brilliantly colored scoria deposits mantling the cone. The eruptions forming the 340-m-high Sunset Crater cinder cone were initially considered from tree-ring dating to have begun between the growing seasons of 1064-1065 CE; however, more recent paleomagnetic evidence places the activity between about 1080 and 1150 CE. The largest vent, Sunset Crater itself, was the source of the Bonito and Kana-a lava flows that extended about 2.5 km NW and 9.6 km NE, respectively. Additional vents along a 10-km-long fissure extending SE produced small spatter ramparts and a 6.4-km-long lava flow to the east. A blanket of ash and lapilli covered an area of more than 2100 km2 and forced the abandonment of settlements of the indigenous Sinagua Indians. Arculus R J, Gust D A, 1995. Regional petrology of the San Francisco Volcanic Field, Arizona, USA. J Petr, 36: 827-861. Elson M D, Ort M H, Hesse S J, Duffield W A, 2002. Lava, corn, and ritual in the northern Southwest. Amer Antiquity, 67: 119-135. Holm R F, Moore R B, 1987. Holocene scoria cone and lava flows at Sunset Crater, northern Arizona. In: Bues S S (ed) Geol Soc Amer Centennial Field Guide, Rocky Mountain Sec, 2: 1-475. Moore R B, Wolfe E W, 1987. Geologic map of the east part of the San Francisco volcanic field, north-Central Arizona. U S Geol Surv Map, MF-1960, 46 p text. Ort M H, Elson M D, Anderson K C, Duffield W A, Samples T L, 2008. Variable effects of cinder-cone eruptions on prehistoric agrarian human populations in the American southwest. J. Volcanol. Geotherm. Res., 176: 363-376. Smiley T L, 1958. The geology and dating of Sunset Crater, Flagstaff, Arizona. New Mexico Geol Soc Guidebook, 9th Field Conf, p 186-190. There is no Deformation History data available for San Francisco Volcanic Field. There is no Emissions History data available for San Francisco Volcanic Field. 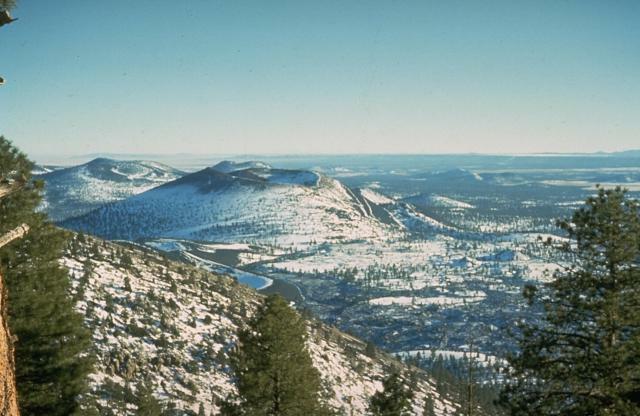 Snow-mantled Sunset Crater (left-center), seen from O'Leary Peak to the NW, is the youngest volcanic feature of the San Francisco Mountain volcanic field, which covers a vast area of northern Arizona between Flagstaff and the Grand Canyon. The Sunset Crater eruption began about 1100 CE from a chain of cinder cones and vents trending NW-SE, the largest of which is Sunset Crater. Three lava flows were erupted, the longest of which traveled 11 km to the NE. Photo by Ed Wolfe, 1973 (U.S. Geological Survey). The 60-m-deep Gyp Crater in the foreground is located at about the midpoint of a 10-km-long eruptive fissure extending SE from Sunset Crater, the unvegetated cinder cone at the left-center. Paleomagnetic evidence places the age of the Sunset Crater eruption at between about 1080 and 1150 CE. O'Leary Peak, a Pleistocene lava dome, forms the prominent peak in the right background. Sunset Crater at the upper right is seen in this aerial view along a 10-km-long eruptive fissure extending to its SE. An eruption from Gyp Crater, immediately behind the left rim of the snow-dappled Pleistocene Double Crater in the foreground, occurred along the SE-trending fissure. Snow-capped San Francisco Mountain appears in the background at the upper left. The snow-drapped symmetrical cinder cone at the left side of the photo is Sunset Crater, Arizona's most recently active volcano. The broad snow-capped mountain in the background to the west, behind and to the right of Sunset Crater, is San Francisco Mountain. 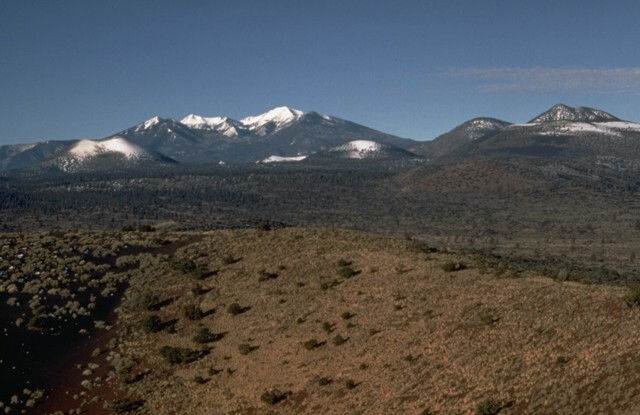 It is the centerpiece of the San Francisco Mountain volcanic field, which covers 5000 sq km of northern Arizona. The massive eroded Pleistocene stratovolcano is Arizona's highest peak. The peak on the right horizon is O'Leary Peak, a Pleistocene rhyodacitic lava dome complex. Photo by Ed Wolfe, 1970 (U.S. Geological Survey). 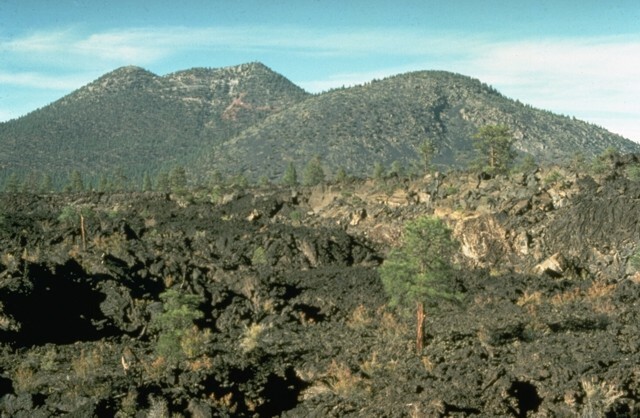 The rugged Bonito lava flow in the foreground was erupted from Sunset Crater in two stages. The flow originated from vents at the west to NW base of Sunset Crater, which is out of view to the right. The peak beyond the flow to the north is O'Leary Peak, which consists of two rhyodacitic lava domes of Pleistocene age. 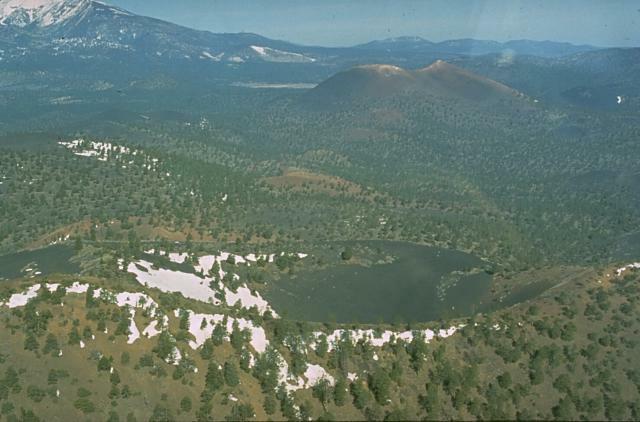 O'Leary Peak is the NE-most silicic center in the San Francisco Mountain volcanic field. Photo by Richard Moore, 1975 (U.S. Geological Survey). The Sunset Crater eruption is considered from paleomagnetic evidence to have begun about 1080-1150 CE. 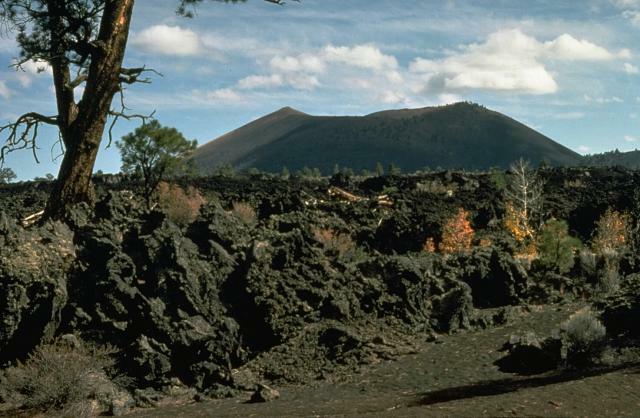 The Bonito lava flow in the foreground originated from Sunset Crater, the cinder cone in the background. 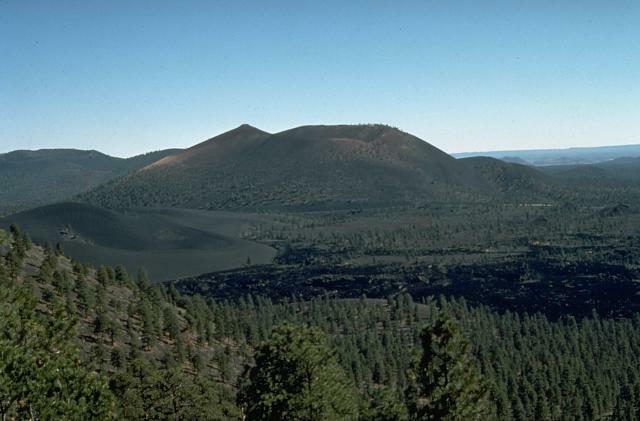 The Sunset Crater eruption produced a blanket of ash and lapilli covering an area of more than 2100 sq km and forced the abandonment of settlements of the indigenous Sinagua Indians. Photo by Ed Wolfe, 1977 (U.S. Geological Survey). The Bonita lava flow in the foreground of this view from O'Leary Peak, NW of Sunset Crater, was erupted from two or more vents on the western to NW flank of Sunset Crater. The flow contains both scoria-mantled portions erupted concurrently with major explosive activity from Sunset Crater and darker, scoria-free portions erupted during later stages of the eruption. Portions of the scoria-mantled flow were broken away and rafted along during the late-stage lava extrusion. 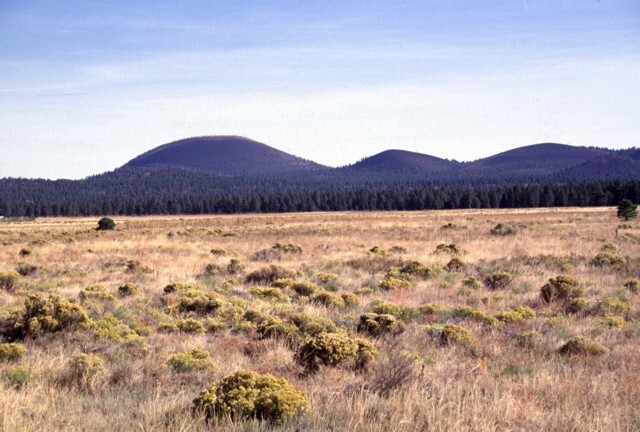 Sunset Crater (left) and adjacent cinder cones are seen here from the west across the meadows of Bonito Park. Sunset Crater and adjacent cones were erupted along a 10-km-long, NW-SE-trending line, with Sunset Crater being the NW-most vent. 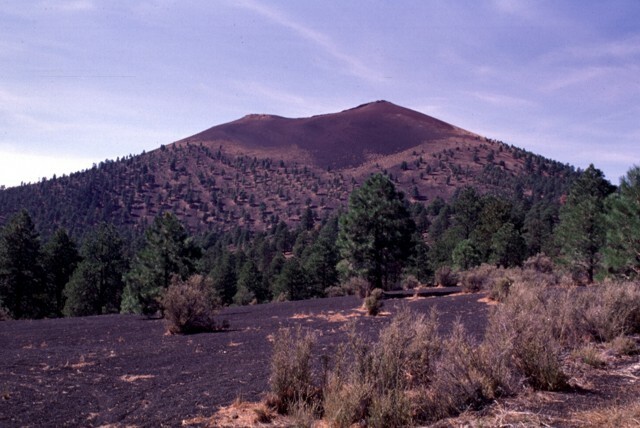 The Sunset Crater eruptions severly affected Sinagua Indians living in the area, who temporarily evacuated the region. Photo by Lee Siebert, 1996 (Smithsonian Institution). Sunset Crater, seen here from the NE, is the centerpiece of Sunset Crater National Monument. During the 1920's, geologist H.S. Colton successfully lobbied to prevent a Hollywood movie company from blowing up the cone to simulate a volcanic eruption. The monument was subsequently established to protect the cone. The proximal part of the Kana-a lava flow, erupted from a vent on the NE flank, is buried here by tephra. The flow was the longest from the Sunset Crater vent system and traveled 11 km to the NE. The following 205 samples associated with this volcano can be found in the Smithsonian's NMNH Department of Mineral Sciences collections, and may be availble for research (contact the Rock and Ore Collections Manager). Catalog number links will open a window with more information. Large Eruptions of San Francisco Volcanic Field Information about large Quaternary eruptions (VEI >= 4) is cataloged in the Large Magnitude Explosive Volcanic Eruptions (LaMEVE) database of the Volcano Global Risk Identification and Analysis Project (VOGRIPA).